Bacon Potato Salad is a summer favorite at our house. Somehow those summer favorites just don’t taste the same when there is no sunshine around! Ever wonder why sometimes potato salad comes out creamy with nice firm potatoes and other times the same recipe is mushy and dry. I went looking for the answer. Just cause I’m curious that way. And I figure if I am — so is someone else. The reason is the type of potatoes we use. I even tried it with two different kinds of potatoes. Just for you. ‘Tis true, my friends — the type of potato makes the difference! Red potatoes or Yukon gold are what is called waxy potatoes. They hold their shape well and meld in with the dressing without absorbing it so the salad remains creamy. Russets, in the “floury potato” category, are more dry so they absorb the dressing. Russets also tend to fall apart and to be somewhat gummy — more desirable for baking or mashing. If you have no choice but to use russets, add an extra tablespoon or two of sour cream to help keep the potato salad moist. Whichever you use, don’t forget to salt the water you cook them in. Nutritionally all potatoes are a good source of Vitamin C and potassium. They have no cholesterol and are low in fat. A potato is 20 carbs per one cup serving. Anyone counting carbs will want to eat in moderation, limiting to one serving, and balance with protein for the rest of the meal. Today I happened to have a half pound of bacon left from another recipe. Most of the time, I don’t use sliced bacon quickly enough before it begins to grow blue fuzzies. However, an acceptable substitute for crumbled bacon in recipes are the real bacon crumbles found in the grocery store in the salad fixin’s aisle. Not the artificial ones, but the ones made from real bacon. Use one tablespoon per two slices of bacon. Homemade crumbles come in at 6 grams of fat per serving. Packaged crumbles are 1.5 grams of fat. Sodium levels in the packaged bacon is 220 mg per tablespoon vs 300 mg for 2 slices of bacon. And the packaged bacon keeps longer and there is no messy bacon grease disposal. And you know how you always want to add extra bacon – cause if a little is so good, a lot is a lot better. In the summer, I often keep hard boiled eggs in the refrigerator for quick snacks, egg salad sandwiches or to add to a tossed salad. Makes them easy to add to recipes like this – and to slice an extra one on top for added color. You can use 3 or 4 green onions instead of the diced onion for a more delicate flavor. I used to slice the celery thinly, now I just used the same chopper I bought for chopping onions. We decided we liked the smaller crunch better. Diced red pepper gives a spark of color, but that is optional. Featured at Create With Joy! Creamy potato salad with eggs and bacon, cruncy onion, celery and bell pepper, lightly flavored with mustard -- yum! Place the potatoes in a pot with salted water to cover, and bring to a boil. Cook for 15-20 minutes, or until tender enough to insert fork. Begin to check frequently after 12-15 minutes at a boil to prevent overcooking. Drain and cool. Hasten cooling by spread cooked potatoes on cutting board or cookie sheet. Meanwhile, place eggs in a saucepan and cover with cold water. Bring water to a boil for two minutes and remove from heat. Cover, and let eggs stand in hot water for 12 minutes. Drain hot water, and place eggs in cold water to cool. While potatoes and eggs are cooking, place bacon slices in the microwave on bacon crisper for about 4 minutes, until crisp. OR fry in a skillet over medium-high heat. Crumble half of the bacon slices into the mayonnaise mixture. Reserve the rest for garnish. Mix sour cream, mayonnaise and mustard. Chop onion and dice celery and, if using, red pepper. Crumble bacon, set aside about a tablespoonful for garnish. Add each to mayonnaise mixture. Peel eggs and coarsely chop , then add to dressing mixture without stirring. Add cooled potatoes into dressing mixture and stir until well coated. Crumble the remaining bacon over the potato salad, then sprinkle chopped parsley over the top. Refrigerate at least four hours, overnight is better. Serve cold. Makes about 8 servings. Congratulations – you are featured this week at Inspire Me Monday at Create With Joy! I am always on the lookout for a great Potato Salad Recipe and yours fills the bill! I appreciate your research as well. Can’t wait to give this a try! That looks like the perfect side for a summer BBQ! This potato salad looks and sounds totally awesome! Stopping by from Ms. enPlace and following on Facebook. I like the way you think! Bacon, eggs and a little potato — great breakfast! 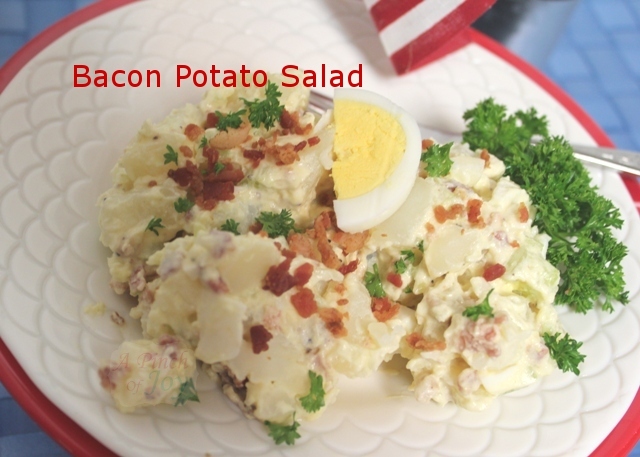 Your Bacon Potato Salad is just perfect for the upcoming holiday, it looks delicious! Hope you have a very special week end and thank you so much for sharing with Full Plate Thursday. You had me at bacon! I’ve had the same issue with not using up a pack of bacon quick enough. But the real bacon pieces are a fine substitute. So good to know about the potatoes. Thanks for sharing the your recipe at Show & Tell…sounds really good. I’m going to pin it to my recipe board. I didn’t realize how many recipes I have that use bacon until I started blogging! Thanks for the pin!